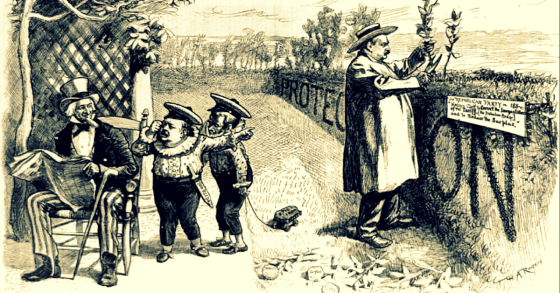 President Grover Cleveland trims “tariff, the protection hedge” to reduce the “surplus”. The tariff debate and controversy seems to be escalating and has been leading to tremendous stock market volatility. Whenever there is such a heated topic that catalyzes strong emotions I like to take a step back and find ways to drown out the cacophony. One of the ways I do this is to ignore today and look to history to see what I can learn from the past. Fortunately, we have a strong history of tariffs and debate about them that allows a resourceful and curious mind to find relevant historical information. And while his focus on statistical minutia was overwhelming there was the occasional nugget which bubbled to the surface. For example, here is some interesting information about immigration, which is obviously still a very heated topic today. I guess if Donald Trump were president back then he would have said why can’t we have more people from Sweden (versus Norway today) instead of getting people from those “&@*le countries” like Italy, Russia, Austria-Hungary, and Portugal. I digress. Cleveland was the only president who served two terms that were not consecutive (1885-88 and 1893-96). He was only one of two Democrats to be elected president between 1861 and 1933. Unfortunately for him, his second term was marred by the panic of 1893 so he was not judged so well at the time. Upon further reflection, however, historians have been more kind to him and I can see why. He was very ethical, he went after corruption, he believed in a strong balance between private initiative and rewards and government involvement, he had a great command of details (perhaps too much), and was against protectionism which, ironically, became more of the thinking of William McKinley after he became president and cut tariffs despite having been such an advocate of tariffs such that the new legislation was called the McKinley Tariff. I believe our present tariff law, if allowed a fair opportunity, will in the near future yield a revenue which, with reasonably economical expenditures, will overcome all deficiencies. In the meantime no deficit that has occurred or may occur need excite or disturb us. To meet any such deficit we have in the Treasury in addition to a gold reserve of one hundred millions a surplus of more than $128,000,000 applicable to the payment of the expenses of the Government, and which must, unless expended for that purpose, remain a useless hoard, or, if not extravagantly wasted, must in any event be perverted from the purpose of its exaction from our people. The payment, therefore, of any deficiency in the revenue from this fund is nothing more than its proper and legitimate use. 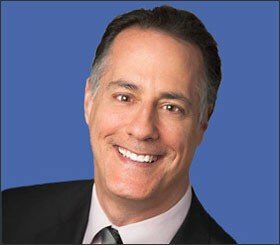 Cleveland is correctly pointing out that the government should not take more money out of the economy when it already has huge reserves to cover all necessary expenditures and any emergencies. The build-up of such a war chest can create the potential for a terrible misallocation of capital and create big economic problems as demand is withdrawn from the economy due to excessive taxation. He then goes on to point out some of the key differences between governments and individuals when it comes to deficits. The Government thus applying a surplus fortunately in its Treasury to the payment of expenses not met by its current revenues is not at all to be likened to a man living beyond his income and thus incurring debt or encroaching on his principal. It is not one of the functions of our Government to accumulate and make additions to a fund not needed for immediate expenditure. With individuals it is the chief object of struggle and effort. The application of an accumulated fund by the Government to the payment of its running expenses is a duty. An individual living beyond his income and embarrassing himself with debt or drawing upon his accumulated fund of principal is either unfortunate or improvident. The distinction is between a government charged with the duty of expending for the benefit of the people and for proper purposes all the money it receives from any source, and the individual, who is expected to manifest a natural desire to avoid debt or to accumulate as much as possible and to live within the income derived from such accumulations, to the end that they may be increased or at least remain unimpaired for the future use and enjoyment of himself or the objects of his love and affection who may survive him. It is immeasurably better to appropriate our surplus to the payment of justifiable expenses than to allow it to become an invitation to reckless appropriations and extravagant expenditures. I suppose it will not be denied that under the present law our people obtain the necessaries of a comfortable existence at a cheaper rate than formerly. This is a matter of supreme importance, since it is the palpable duty of every just government to make the burdens of taxation as light as possible. The people should not be required to relinquish this privilege of cheaper living except under the stress of their Government’s necessity made plainly manifest. Cleveland is pointing out that government is not nearly as revenue constrained as individuals and businesses and has a duty to wisely spend and/or invest its surplus and not build up a war chest of reserves that can invite the misallocation of it by empire builders. The Democrats lost control of Congress and in 1890 it was the Republicans who implemented The Tariff Act of 1890, commonly called the McKinley Tariff. It raised the duty on imports by an average of 50%. I think it is instructive to quote liberally from Cleveland’s state of the union address which he devotes heavily to the issue of tariffs. In many ways, these arguments can be applied to China today as their position in the world and stage of development have some similarities to the United States in the 1880s and 90s. It also offers great lessons for us today as we should not forget that when specific industries are protected it may be beneficial to those industries in the short run, but it creates less of an incentive to innovate and often hurts the rest of the country. Workers theoretically benefitting from tariffs are also consumers too so we should not forget that as Cleveland points out. [A]nd yet with slight reflection they will not overlook the fact that they are consumers with the rest; that they too have their own wants and those of their families to supply from their earnings, and that the price of the necessaries of life, as well as the amount of their wages, will regulate the measure of their welfare and comfort. Nor can the worker in manufactures fail to understand that while a high tariff is claimed to be necessary to allow the payment of remunerative wages, it certainly results in a very large increase in the price of nearly all sorts of manufactures, which, in almost countless forms, he needs for the use of himself and his family. He receives at the desk of his employer his wages, and perhaps before he reaches his home is obliged, in a purchase for family use of an article which embraces his own labor, to return in the payment of the increase in price which the tariff permits the hard-earned compensation of many days of toil. And the farmer is hurt also by higher prices. He then goes on to use a quantitative example of the harm tariffs do. Don’t forget that this is during a state of the union address. Imagine being in the audience for this. I think it may be fairly assumed that a large proportion of the sheep owned by the farmers throughout the country are found in small flocks, numbering from twenty-five to fifty. The duty on the grade of imported wool which these sheep yield is 10 cents each pound if of the value of 30 cents or less and 12 cents if of the value of more than 30 cents. If the liberal estimate of 6 pounds be allowed for each fleece, the duty thereon would be 60 or 72 cents; and this may be taken as the utmost enhancement of its price to the farmer by reason of this duty. Eighteen dollars would thus represent the increased price of the wool from twenty-five sheep and $36 that from the wool of fifty sheep; and at present values this addition would amount to about one-third of its price. If upon its sale the farmer receives this or a less tariff profit, the wool leaves his hands charged with precisely that sum, which in all its changes will adhere to it until it reaches the consumer. When manufactured into cloth and other goods and material for use, its cost is not only increased to the extent of the farmer’s tariff profit, but a further sum has been added for the benefit of the manufacturer under the operation of other tariff laws. In the meantime the day arrives when the farmer finds it necessary to purchase woolen goods and material to clothe himself and family for the winter. When he faces the tradesman for that purpose, he discovers that he is obliged not only to return in the way of increased prices his tariff profit on the wool he sold, and which then perhaps lies before him in manufactured form, but that he must add a considerable sum thereto to meet a further increase in cost caused by a tariff duty on the manufacture. Thus in the end he is aroused to the fact that he has paid upon a moderate purchase, as a result of the tariff scheme, which when he sold his wool seemed so profitable, an increase in price more than sufficient to sweep away all the tariff profit he received upon the wool he produced and sold. He then goes on to talk about how so many more people are hurt by the higher prices caused by tariffs than those who seemingly benefit from them. And yet, when second-order effects are taken into consideration, these initial beneficiaries are also harmed. He then goes on to make the very sophisticated argument that in the absence of powerful economic trusts that conspire to keep prices higher than would otherwise be the case, the free market often can produce prices below the highest limit allowed by tariffs. Cleveland says the following. I must say Grover Cleveland has really impressed me. He understood that governments should not hoard savings that came from the hard earned money of its citizens and that it had a duty to recirculate that money back into the economy. He also understood the harmful effects of tariffs on the well being of the population. 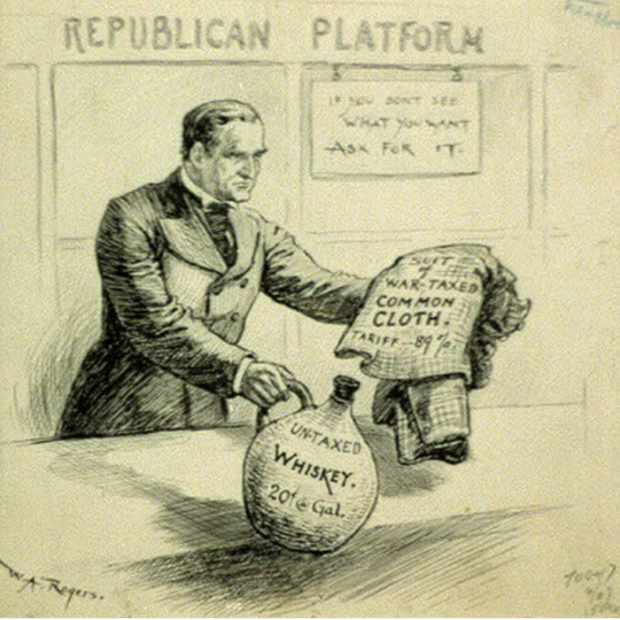 I will leave you with a cartoon from Harper’s Weekly on July 7, 1888, that shows how the wool used by the everyday American has gone up significantly in price while whiskey has not. The picture came from an interesting blog post about the McKinley Tariffs that I suggest people read to understand more of the negative effects of the tariffs on the United States.